I told myself I'd review Biochem notes for College Bowl. I got as far as transferring the documents from hard drive to Uva*. Because I got distracted by these precious cookies. Precious because Samoas are like an ancient artifact ever since the name change and box change and I guess bakery change (?). Precious because I spent no less than three hours cutting rounds and "gluing" coconut to cookie and chocolate dipping. (Good thing I had Audrey to teach me about DNA and Mendel's peas.) Precious because I probably won't have the patience to make them for another few years. Recipe adapted from here, divided in half, which still gave me plenty enough. If you are in a pinch and lack a special cookie cutter, might I suggest a shot glass and a wide bubble tea straw. I cheated/made my life a bit easier by using a jar of salted caramel I scored from a Smucker's info session. It still involved patiently painting a layer of caramel on each cookie to make sure the coconut stuck, but at least it was one less pot to clean. 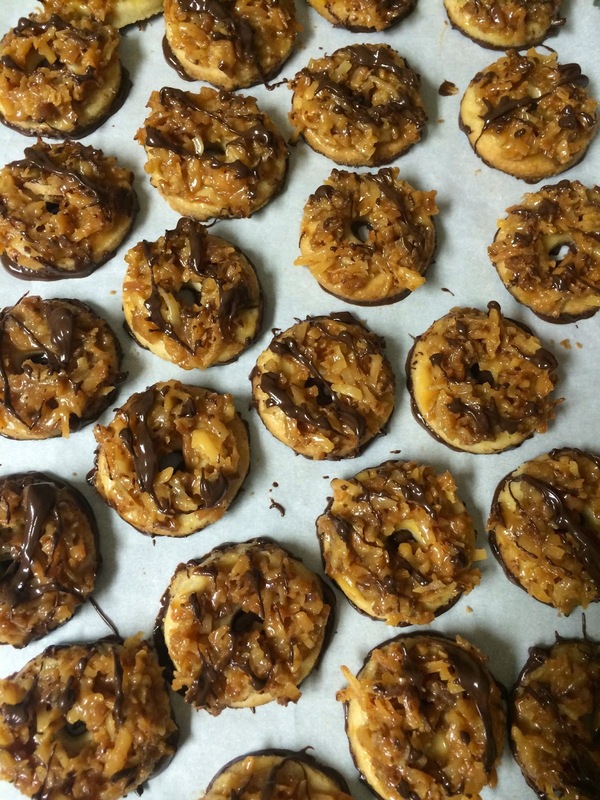 I did try my hand at making Samoas a couple years ago, and it was a disaster because I specifically remember how finicky the coconut/caramel mixture is to deal with when too hot or too cold. I'm telling you - this solves all problems. I knew it was all worth it when Bianca said these were better than the original Girl Scout Cookie, and that may or may not have made my Friday. Saved myself $3.75 the next time I walked pass a GSC table because my faves are Samoas and now I know I don't have to buy them. *My beautiful little Mac goes by Uva.